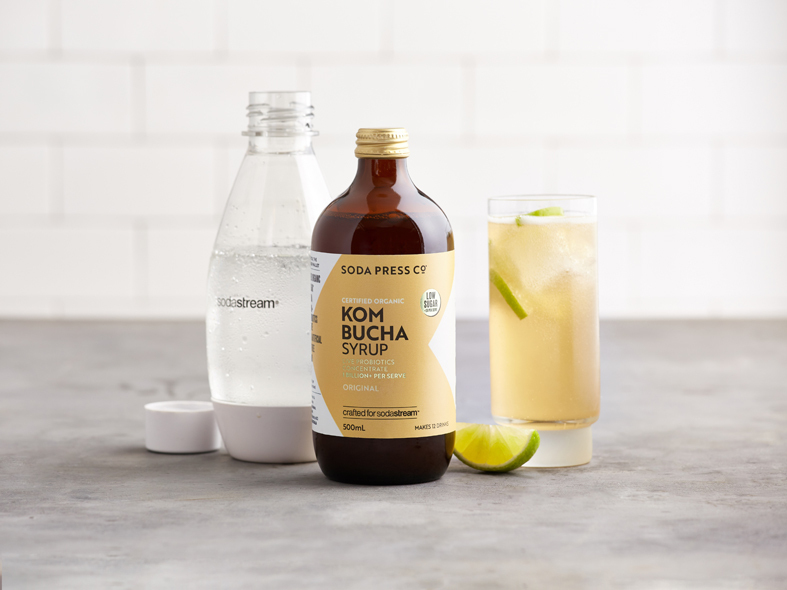 Quick kombucha at home: SodaStream partners with Soda Press Co.
You are in : All News > Quick kombucha at home: SodaStream partners with Soda Press Co.
08 Apr 2019 --- Soda Press Co. (Australia) says it is revolutionizing the kombucha scene with its release of “the world’s first certified organic kombucha concentrate that is also shelf-stable.” The concept is designed to be paired with the rapid expansion of SodaStream sparkling water markers in the market. SodaStream invested into a partnership with Soda Press Co. who also make organic, reduced sugar, soda syrups at the start of 2019 to satisfy the premium end of Sodastreams’ flavor offerings. The product features a “live probiotics concentrate” claim on the front of the pack. Kombucha, the fermented, lightly effervescent black or green tea drink from China, has been one of the fastest growing areas in the ready-to-drink or iced tea market in recent years, helping to drive the overall market forward. It has been available in other countries outside Asia for some years. But, with rising interest in functional beverages and fermented products and a focus on positioning itself as sustainable wellbeing boosting alternative to artificial soft drinks, it has moved out of the specialty sector and more into the mainstream. According to Innova Market Insights data, over 9.2 percent of global iced tea launches in the 12 months to the end of October 2018 featured kombucha in a rising range of flavors and formats. This is up from 8.7 percent in 2017 and just over 5.0 percent in 2016. Click to EnlargeSoda Press Co. (Australia) says it is revolutionizing the kombucha scene with its release of “the world’s first certified organic kombucha concentrate that is also shelf-stable.” Penetration is even higher in specific countries, such as the US, where it reaches nearly 21 percent and in Australia, where it reaches over 40 percent, albeit from a tiny base. The UK, not a traditional market for iced tea, with the majority of consumers still preferring to drink their tea hot, has also seen high levels of interest, with kombucha accounting for over a third of iced tea launches. Penetration in Europe overall is slightly below the global figure on 8.8 percent, however. New Zealander Cameron Romeril is behind the innovative kombucha syrup concept, which cuts out the complicated brewing process involved in making kombucha and the costly process of purchasing it. “We’ve been working on this innovation for well over a year now. We wanted to create quality Kombucha that doesn’t cost the earth,” says Cameron. “By bringing back one of the oldest and strongest kombucha cultures known, we’ve been able to create a shelf-stable product that packs a whopping 1 Billion + live probiotics per serve. We’re better for you, the planet, and your wallet,” he adds. The syrup has launched with an original Kombucha flavor, which will soon be followed by the launch of Cola Nut and Lime and Kaffir Lime. The original flavor has a powerful kick with crisp apple and juicy peach tones. Kombucha has been in the spotlight recently. Coca-Cola bought its first fully owned brand in the space with the purchase of Organic & Raw Trading Co. in Australia, owner of the Mojo brand last year. It was not the first major multinational to recognize the potential of kombucha, however. This deal was preceded by PepsiCo’s acquisition of US organic kombucha company Kevita at the end of 2016. An exciting arrival on the market in the second half of 2018 came from specialty coffee chain Starbucks’ Evolution cold-pressed fresh juice brand, which was used for Evolution Fresh Organic Sparkling Kombucha drinks in a range of six exotic flavors. These are: Ginger Lemon Honeycrisp, Mango Pineapple, Ginger Greens, Spicy Greens, Pink Grapefruit and Turmeric Pineapple Coconut. 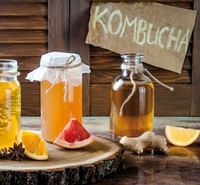 The World of Food Ingredients recently featured an interesting technical article on how to overcome the formulation challenges that come with creating kombucha.